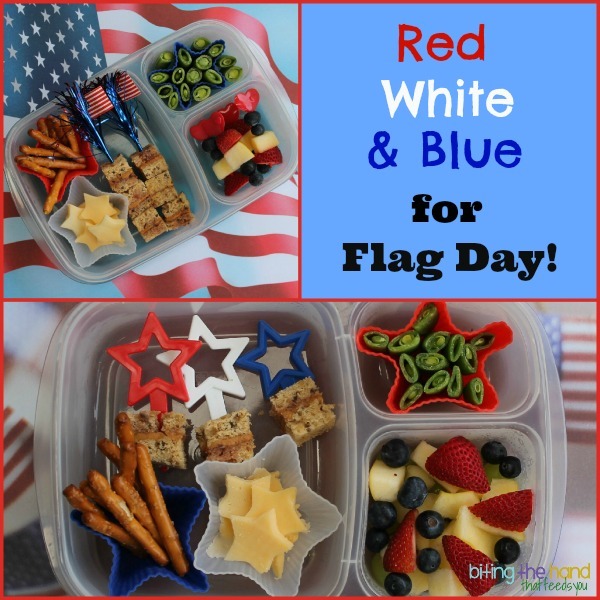 Biting The Hand That Feeds You: Waving the Flag - Happy Flag Day! Waving the Flag - Happy Flag Day! Sometimes it's easier to have a theme to inspire me. So I will grasp at any straw... or in this case, random holiday, to help me decide what I'm going to design our lunches around. So. Happy Flag Day, everyone! Neither girl eats a lot of sandwich lately, so I used my FunBites Cube It cutter to make enough little bites out of a single gluten-free PBJ for both girls. 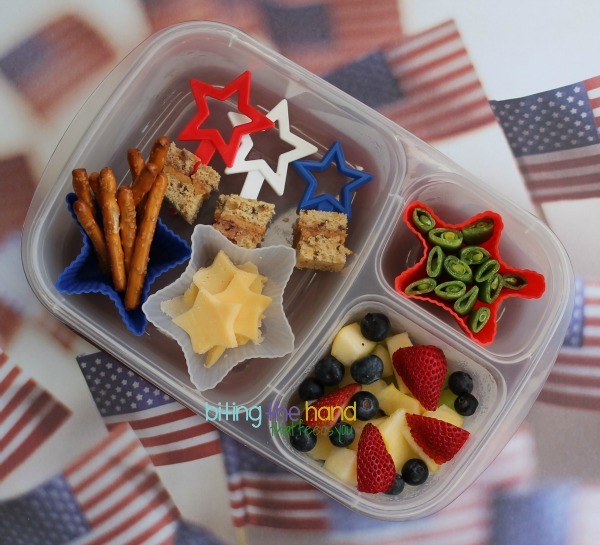 For E, I stuck in some patriotic star cupcake picks to help make it fun. And it worked. She ate them all! Red, White, and Blue: I happened to have some chunks of Golden Delicious apples to use up, plus strawberries that needed some judicious pruning to salvage the still-edible parts, and some blueberries to use up. How perfect is that? Stars and Stripes: I was excited to have all the right colors of star silicone muffin cups (the white ones came from this set.) I used a mini star cutter on some white gouda cheese, and gave E a few stars, plus the scraps. For "stripes," I included some gluten-free pretzel sticks. I used all the same foods and theme for both girls, which I rarely ever do, mostly because they have different tastes/ And I'm lazy. Since I didn't have to worry about her gouging out anyone's eye, Big Sis got some patriotic wooden flag skewers I found at a local party supply store. So patriotic! 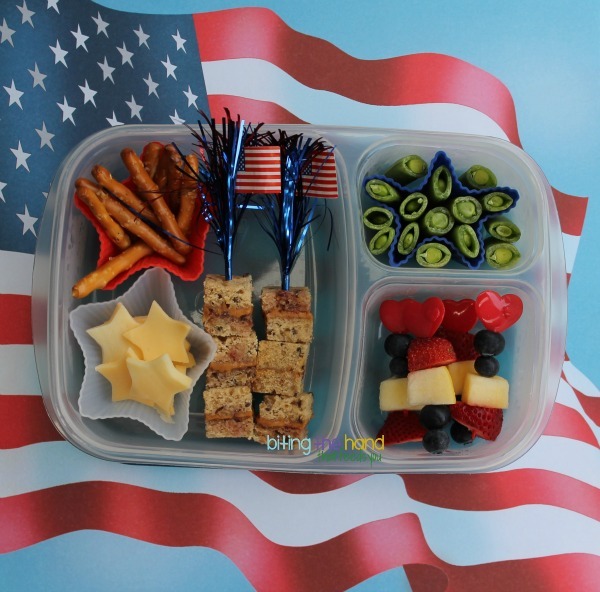 Thanks so much for linking up to the 4th of July Linky Party & Happy Independence Day!